Is this stylish stylus worth it? After what seems like ages of waiting, the iPad Pro is finally here. The 12.9-inch slate looks to be a productivity powerhouse, not only because of its potential as a laptop replacement, but also because of its accessories. One of which is Apple's new stylus, the Apple Pencil. Regardless of what you may think of the name Apple chose for its stylus, the Apple Pencil shows real promise for getting down and dirty with work tasks. And in a portion of the market that already counts the stylus-toting Surface Pro 3 among its ranks, that's definitely a good thing. Frankly, if Apple hadn't introduced a first-party stylus option for the iPad Pro, it would have had even more of an uphill climb to win over its target audience: creative professionals and business users. With that in mind, let's take a look at the what makes the Apple Pencil tick (or tap, in this case), and why it may be attractive for professionals of all stripes. One of the main benefits of the Apple Pencil is its first-party support. While it's true that third-party styli for iOS have been available for some time, they all require SDK support built into other apps to work. This makes things a little clunky if the developer of one of your favorite apps doesn't adopt support for your particular stylus. The Apple Pencil fixes this problem by including support at the OS level, meaning it should be much easier for developers to add pen support into their apps. Apple is touting the fact that the iPad Pro will pick up touches from the Apple Pencil "twice as fast" as it does from traditional finger input, meaning you can be much more deliberate in your positioning. And even though the iPad Pro doesn't sport the same 3D Touch technology that features on the iPhone 6s and iPhone 6s Plus, the Apple Pen sort of makes up for that fact with built-in sensors for pressure, tilt, and position. All of this adds up to a much more precise stylus experience than traditional third-party options. If you're one of the folks who hopped on the iOS stylus bandwagon a bit early and found the experience to be clunky, the Apple Pencil might be the accessory to reel you back in. The one big caveat here, however, is that the Apple Pencil is only supported on the iPad Pro. It's quite a shame, and it leaves those who would rather not drop cash on a tablet that costs almost as much as a full-fledged MacBook out in the cold. Yes, the Apple Pencil sports deep integration with iOS 9, but that's nothing without intriguing ways to use it. Thankfully, the iPad Pro will ship with a number of apps and use-cases for the Apple Pencil on launch. When the iPad Pro arrives in November, iOS 9 will already pack some built-in apps with Apple Pencil support that business users will find handy. The most obvious example is the Notes app, which is getting a bit of a revamp with iOS 9. Along with the features that are hitting all iOS devices, you'll be able to quickly take out the Apple Pencil and jot down your thoughts in a more natural manner. There will also be some interesting uses with the built-in Mail app, including the ability to mark up emails and attached document, highlighting the important parts and making notes. Sure, it isn't revolutionary if you've used a stylus before, but this is a new frontier for an iOS device. Even Microsoft is jumping on board, adding in support for the Apple Pencil in its Office suite of apps. With added inking support, users can more naturally take advantage of pen and highlighter tools to mark up documents, spreadsheets, and presentations. This is a pretty big deal for the business crowd, as Word, Excel and PowerPoint still dominate the productivity field, and it brings the iOS Office suite up to par with its Windows cousin. 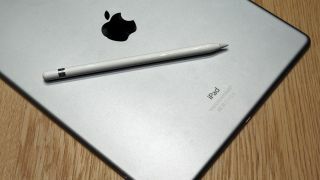 Where you'll really see the Apple Pencil shine, however, is with widespread support from third-party apps from the App Store. In fact, despite some of the iPad Pro's shortcomings, this may be the area that gives it an edge over other tablets in the same space. The App Store already dwarfs many of Apple's competitors when it comes to the sheer number of high-quality apps available on the platform. Once these developers start adding support for the Apple Pencil, there's a chance that the selection of stylus-ready apps could give Apple another substantial leg up, particularly with productivity apps. In the end, while the Apple Pen may be a great addition to iOS, its tie to the iPad Pro could make it a tough sell. As a tool, the stylus certainly isn't anything new or revolutionary, and Apple is restricting its first foray in the space to a rather expensive piece of tech. Apple's main competition in the professional tablet space is arguably Microsoft's Surface Pro 3. While the iPad Pro and Microsoft's slate start out at the same price, the Surface Pro 3 comes out of the box with a stylus of its own, while the Apple Pen will require an extra $99. Essentially, if stylus support is a big deal for your needs, you can shell out a bit less for the Surface Pro 3, and you'll be getting access to a full desktop experience to boot. And if stylus support truly isn't that important to you, you may be better off sticking with a MacBook considering the closeness in price to a fully configured iPad Pro with the keyboard cover. Still, if you're deeply invested in Apple's ecosystem, and especially if your company happens to take advantage of IBM's iOS apps, the iPad Pro and the Apple Pencil might be worth the premium. Add in the potential for robust third-party app support, the iPad Pro with an Apple Pencil looks even better.